Get married to the one you love while the sun sets across the Pacific. There are many romantic beach locations along the coast that offer the perfect location for you to say “I do” at your Cabo San Lucas Wedding. Traditional Cabo San Lucas weddings are beautiful in a small chapel or church is a perfect option. Cabo San Lucas has many chapels with traditional Spanish architecture along with more modern churches. Villas can be very luxurious place to get married in Cabo. With all of the amenities of a lavish home, you’ll feel fully pampered on your special day. 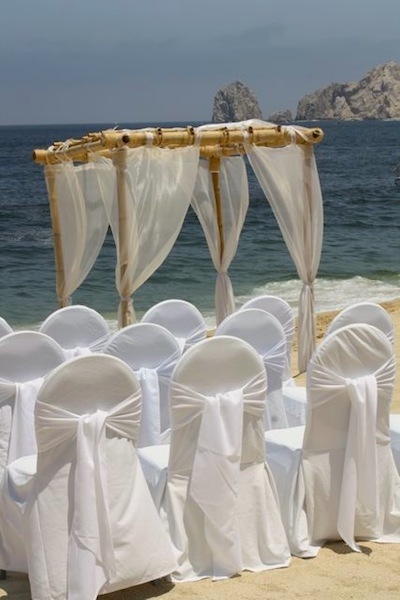 This is a very elegant place to have your Cabo San Lucas wedding ceremony and seat a large number of people. It will provide you with plenty of space for a large wedding. Many Cabo San Lucas hotels have beautiful ballrooms for your Cabo Wedding. Have your Cabo San Lucas Wedding while aboard a luxury yacht or ship. Your guests can watch you say your vows while the sea breeze blows though your hair or have a private ceremony and enjoy the view alone with your fiance. The Cabo Surf Hotel is the perfect Los Cabos Wedding Venue. Villas can be the perfect location for an intimate wedding. The Hilton Los Cabos offers a great location for weddings, as well as offers many wedding services to help you plan your big day.